Bringing remarks at the Bahamas Association of Compliance Officers (BACO) 8th Annual Northern Bahamas Conference held in Freeport April 25, Minister for Grand Bahama Michael Darville said he was considering new laws to properly regulate the maritime and industrial sectors. 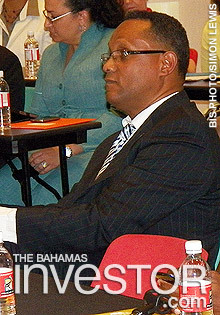 Pictured: Minister for Grand Bahama Michael Darville, attending the BACO Conference, Grand Bahama April 25. Minister for Grand Bahama Michael Darville said April 25 that new and modern policies are required to properly regulated the maritime and industrial sectors of the island and protect the environment. Darville was bringing remarks at the Bahamas Association of Compliance Officers (BACO) 8th Annual Northern Bahamas Conference held at the Pelican Bay Resort. He said also that BACO is to be commended for enhancing the integrity of the second pillar of the Bahamian economy, financial services. He told the gathering that the future of compliance is bright, as technology will change the way compliance programmes are executed. 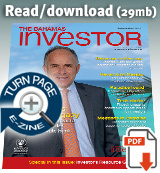 Darville stressed that recent events in the global economy has heightened the importance of the compliance field. He made it clear that compliance is not only crucial to the financial services industry, but to almost every industry that impacts growth and development in the country. He said that the financial services industry is the second pillar of the Bahamian economy and for that reason a renewed focus must be placed on growing that sector. “However, in Grand Bahama, there are three principal business sectors, which include tourism, financial services and the maritime industry. Therefore, our island’s stability and economic success relies heavily on the synergistic efforts of the private and public sectors in developing these key areas,” said the Minister. “With the expansion of the Panama Canal schedule to open in 2014, we anticipate exponential growth in our maritime sector. “As we focus on expanding our industrial investments profile on Grand Bahama and encourage large scale developments and anchor projects across our archipelago, now is the time to ensure that this sector is regulated and properly monitored by professional and qualified personnel who are supported by legislation and vested with authority to freely inspect and hold these companies accountable if they are non-compliant with local and international laws,” he stated. The Minister for Grand Bahama went on to say that legislation is required to elevate the standards of how business is conducted across all sectors, and to ensure that international requirements are being met. More specifically, he said new and modern policies are required to regulate the maritime and industrial sectors on Grand Bahama Island to protect the environment where business is conducted. He also said that the Ministry for Grand Bahama and the Ministry of the Environment are in the process of bringing to Parliament amendments to the 1965 Freeport Bye-Laws, and suggested that perhaps BACO will lead the way in determining how the industrial sector can operate and flourish in a properly regulated atmosphere and encourage businesses to use best practices in environmental protection, health and safety. “Compliance must therefore be the concern of everyone and viewed as integral part of industry; a culture that is embraced not only by the government through improved legislation, but also by the senior managers with the implementation of new and improved policies that promote a compliant friendly workplace and the willingness to work with the regulatory body,” he stated. In his remarks, the Minister for Grand Bahama also pointed out that social media is on the rise and is considered a key component of product development, feedback and customer interaction and engagement, and that it is changing the way people manage relationships and it has shortened the time in which it takes to conduct business. He said that businesses need to explore, implement and refine new technologies to continue growing and evolving, adapting to change particularly as threats evolve and risks grows. He was also keen to point out that the very same technologies that help propel a business are the same ones that create new risks. “You must understand that new technologies will open up tremendous opportunities for organizations, therefore your compliance programmes need to be tailored toward managing the associated risks,” the Minister told attendees. “Training and education are keys to the success of any industry, and compliance is no exception. With our country’s reputation on the line and the threat of money laundering abuses, training in this field has become statutorily mandated for all financial institutions and rightfully so. This will ensure that you can continue to govern yourselves in accordance with the highest standards,” he stated. According to the Minister, a well regulated industry will help considerably to sustain and attract businesses to the island of Grand Bahama and by extension, the entire Bahamas. The Bahamas National Trust officially launched its "Conchservation" campaign this week to protect populations of the conch edible sea snail. Environmental activist Robert F Kennedy Jr was in The Bahamas to offer his support. The 60th National Family Island Regatta held in Exuma at the end of last week attracted keen sailors and boat enthusiasts from around The Bahamas. See photos of the event here.